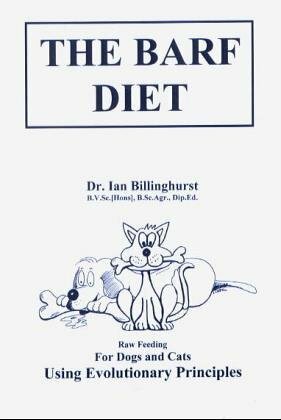 Australian vet Dr Ian Billinghurst’s book Give Your Dog A Bone, which introduced the BARF (biologically appropriate raw food) diet for dogs, threw the cat among the pigeons when it was first published in l993. While we long ago discovered the physical benefits of feeding this species-appropriate diet to our own dogs, we didn’t see it as our place to interfere with or try to convert those people who were happy with the convenience of feeding their dogs a commercially produced product. Raw Dog Food: Is it Natural? After all, dogs are scavengers and will try to pick up nutrients from pretty well anything that even remotely resembles food – sticks, stones, faeces, wood, grass, garden plants, coal, soap, dog food. It’s when they start on other things like the kitchen walls, skirting boards, carpets, the remote control, the post or the family’s pet rabbit that their owners start to think about calling in professional help for a behavioural problem. 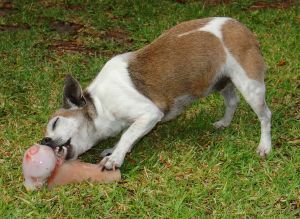 The catalyst for one dog owner calling us for help was when she came home from work to find that her new dog had dug up her old dog and was blissfully feeding on its rotting corpse in the garden. It took a lot of talking to get the lady to understand that what her dog did, though horrific from the human viewpoint, was perfectly normal and instinctive behaviour for a scavenger short on nutrition. Most dog owners try very hard to do the right thing by their pet. They take it to an obedience class and put in a lot of work in an effort to have a well-behaved dog. It can be soul destroying when the dog’s behaviour is great in class but atrocious at home. Frustrated owners often re-home these badly behaved dogs. Some are destroyed because they breached the bounds of human decency by biting somebody. People have come to accept that horses bite. So do cats, hamsters, birds, pigs and rabbits. When a dog bites a person, we kill them rather than try to understand what happened. Dogs and humans are two totally different species trying to live together as friends, but each species has vastly different rules for survival. What we have come to understand after dealing with numerous problem dogs is the link between diet and bad behaviour. We’ve found that a lot, if not all, of the dog behavioural problems we treat happen for the most part as a direct result of the desperation and stress suffered by dogs when owners innocently give them a diet which is inappropriate for their species. However, it is simplistic to say that all bad behaviour can be cured by diet. This is not a cure all. Dogs need to be treated individually, not only in relation to diet but also according to their environment, pack, breed and history. However, suitable rehabilitation of problem dogs can be achieved very quickly if re-training is combined with sensible feeding. Owners are told that their dog will grow out of bad behaviour such as chewing, digging up the garden, jumping up and weeing all over the house. The good news is this is correct. The bad news is that some dogs can also grow into bad behaviour. The connection is food. Pups are generally fed multiple meals from a variety of ingredients and they are usually very happy little creatures. Something happens between happy puppyhood and out-of-control adulthood. A once happy puppy can become desperate and very badly behaved if its nutrition diminishes at the same time as its growth speeds up. Frequently the onset of bad behaviour can be traced close in time to when the frequent feeding regime was changed. If the feeds are reduced before the pup’s growth slows down, the puppy will instinctively seek to supplement its diet by trying to find edible items either in the house or garden. Unfortunately they don’t have a reference book of edible items, so they try anything and everything within reach. 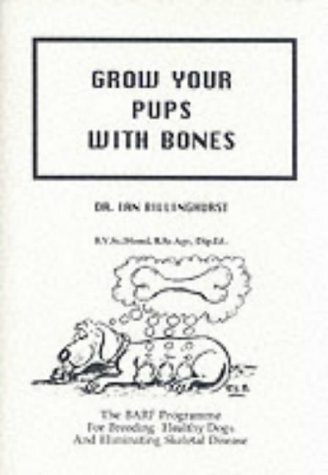 These young dogs can become quite loopy in their search for nutritional supplements. One of the symptoms of this desperation is hyperactivity. The owner then tries to do the right thing and take the dog for long walks ‘to use up its energy’. This can actually make matters worse as the dog expends the energy needed for growth. CASE HISTORY: We work closely with a small, private shelter called Just for Dogs in Derbyshire. Margaret and Doug Smith who run the shelter followed our suggestion and took on the BARF diet for one of the young dogs at the shelter whose behaviour was so atrocious that people would sidle gingerly past her enclosure when they were viewing dogs. No one in their right mind would want Sasha in their home. Because she was housed in a kennel with a cement floor, she was deprived of her ability to forage and supplement her diet. Also, the stress factor associated with kennelling further depleted her of vital nutrients. She consequently became unmanageable in her desperation to supplement and survive. Her behaviour changed dramatically with proper feeding and Sasha is now happily doing much better. After this experience, Doug and Margaret gradually adopted the BARF diet for all of the rescue dogs in the shelter. Their feeding and veterinary expenses have markedly reduced and the previously unwanted dogs are being d very quickly. It is easy to re-home a placid, well-behaved dog. Most people have been through the pangs of dietary excesses and deficiencies at some stage. You may not consciously recognise it as such but you will probably relate to standing in front of an open refrigerator, wanting to eat something but not knowing quite what you want. Mothers of teenage boys will recognise this behaviour. At times of stress and change such as during the teenage years, pregnancy, lactation, grief, loneliness or excessive exercise, our bodies crave different nutrients. Dogs are no different when some nutrient is missing from their diet. They are even more attuned to their body’s needs than we are and develop all sorts of ways to supplement their diet. They don’t stand in front of an open refrigerator, but they do raid food cupboards and feast on table legs, tissues (particularly used ones) and anything else that comes within teeth range. Any or all of these problems can and do create havoc in the home of dog owners who just want their dogs to behave like the dogs on television. The more desperate the dog, the more desperate the behaviour. If dogs knew that biting whilst living with us in our world would result in them being destroyed they wouldn’t do it, particularly since all their actions are about survival. So why do they do it? If you have ever embarked on a weight reduction diet with determination and have been very good for weeks eating all the right things and seeing results, you will know that there comes a time when you would happily rip the arm from someone to get a chocolate bar. Inappropriate dieting can produce aggression in the most amiable of people. This can happen also with the sudden withdrawal of previously often-taken substances such as nicotine, alcohol, barbiturates or sugar. Quite a lot of commercially produced dog food contains addictive ingredients, some as innocent as sugar. The rapid fluctuations in blood sugar levels has a lot to do with dogs that have ‘a mad half hour’ either before or after eating. Left to their own devices, dogs will forage all day and feed on a large variety of plants, insects, bacteria and animal matter. They will roll themselves in all sorts of smelly muck. They come home and spend hours “cleaning” themselves. They pick up a lot of nutrients this way and can become quite aggressive if owners try to wipe them clean or bath them. It’s not that they don’t want to be bathed, but more that they see your behaviour as robbing them of the vital dietary supplements they have managed to pick up and bring home on their feet and fur. CASE HISTORY: Stroller, a fourteen-month-old Blue Roan Cocker Spaniel was booked in for destruction when the owner contacted Bark Busters. He had attacked his owner. In unravelling the story, we found that Stroller had jumped up on the table, snatched a tissue and run under the table guarding his trophy aggressively. What Stroller didn’t know was that the owner’s engagement ring was inside the tissue. She naturally went under the table to retrieve it and Stroller attacked her. She was heartbroken because she thought that Stroller had turned on her. He was brought to Bark Busters’ head office farm for rehabilitation. One of the first things we noticed about him was the putrid smell from both ends. This is one of the signs of dietary stress that we look for. We started him on the BARF diet immediately. Over the next four weeks, the smell disappeared and so did his aggressive possessiveness with items. He took naturally to the diet as do most dogs and that, with a combination of training, exercise and manipulation, produced an absolute treasure of a dog that anyone would be proud to own. He doesn’t now need to ‘hunt’ to supplement his diet, as he was doing when he snatched the tissue. It would have been so easy to destroy him for his ‘aggressive’ behaviour. Dogs also learn to jealously guard areas where they regularly collect minute dietary supplements. This can lead to what appears to be dog aggression if a dog from another pack approaches what they see as their hunting grounds. They have no idea that the area they’re guarding is a public park. Dogs that are regularly fed from a bowl placed always in the same place can become aggressively protective of the bowl since they see it as their only source of food. They are particularly driven by food, as are most animals. If you want your dog to be well behaved, study what dogs are meant to eat and feed it to your dog. Don’t just take our word for it. Do your research. There is a huge groundswell of change happening as people become more and more aware of how diet affects behaviour. Zoo keepers go to great lengths to supply food which animals in their care instinctively eat in a wild situation – bamboo shoots for the giant pandas, leaves from the eucalyptus tree for koalas, fresh fruit and vegetables for the monkeys. Zoo keepers go to these lengths because they know that this ensures their animals remain happy and healthy. We are our dog’s keepers. Why then would we not feed them a diet which is biologically correct for their species? We should try to ‘listen’ to what they’re trying so desperately to us with their ‘bad’ behaviour. She is an experienced dog trainer and has helped to rehabilitate many dogs with behavioural problems.